Lyle: For over 30 years Alex Lifeson has been the guitarist for the progressive rock power trio "Rush". Considered a "musician's musician", Alex has always delivered a high level of musicality along with bassist Geddy Lee and drummer Neil Peart as they collectively created highly complex musical passages that are both popular to fans as well as musicians. Lyle: Alex has used many different guitars, amps and effects. To get his signature rock tone I suggest using a guitar with a humbucker in the bridge position, add a little chorus effect, then add a slight delay or reverb setting to get the big "concert" sound. Suggested listening: Anything from albums Permanent Waves and Moving Pictures and 2112. Lyle: I enjoyed making this lesson topic for several reasons. Alex's role as the guitar player in Rush taught me how to fill up the sound of a rock trio by using big bar chords and a slight effect on the guitar signal like chorus and delay. I also liked the way he had to play real cool rhythms and riffs with the songs which were sometimes very hard to figure out. Lyle: Can anyone tell me what the time signature is in the lesson sample? How many beats are there in a measure of the sample? nate: How can you tell? Lyle: Try tapping your foot to the beat and count. Lyle: Rush played many of their grooves in odd time signatures, or something other than 4/4 time. Lyle: The lesson sample is in 7/8 time. Lyle: 7 - 8th notes per measure! nate: How can you hear just one measure? Lyle: Listen again to the lesson sample and count to 7 for each 8th note beat. Hint - the chords change every measure. Lyle: This is another reason why I like Rush and Alex's guitar parts, they're not always "normal"! Can you feel and count the rhythm in 7/8 time when you listen to the lesson sample? nate: I can definitely tell it's not 4/4, straight up and down stuff. Lyle: Good. Now I'll show you the chords for the first section of the sample. Stratman: Is the sample in the key of E? Lyle: Yes, you are working in the key of E in this lesson. Lyle: These chords for rhythm riff 1 are very typical of how Alex would address the issue of making a full sound using 5 and 6 string bar chords. Notice that they're not minor or major but sus chords (suspended). It's the 3 or b3 degree that makes a chord major or minor. Sus chords avoid the 3rd. Lyle: Remember, for all of the early recordings, Rush didn't use keyboards to add to the sound. Alex was very into creating the big sound on his guitar. Lyle: How is everyone doing with the 7/8 time signature, are you able to change chords in the right spot? Lyle: Ok good. Let's move on to another part of the lesson sample. Lyle: This riff is another typical riff in Alex's style. He likes to change from one sound to another within songs. Here you'll change to a clean sound. Lyle: This rhythm riff sounds so different than the first riff, but it's still the same chords! In the same order too! You're now playing all 4 chords within 1 measure. Lyle: Learn the riff and repeat it over and over. Lyle: Try playing it along to this jam track. Remember you're still in 7/8 time - 7 beats per measure! Lyle: This is a good riff to practice of you have trouble with the arpeggiated version of rhythm riff 2. Lyle: The tone of the guitar solo in the lesson sample has lots of distortion to increase the sustain along with delay/echo and chorus. You're basically in the key of Em so if you wanted to improvise you could use the E minor pentatonic scale. Lyle: I've split the solo into 2 parts since there's not many notes. The first part starts off with harmonic notes. 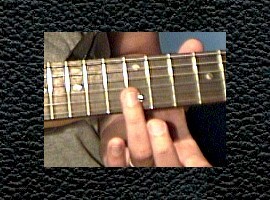 Harmonic notes are generated by lightly touching the string on top of the fret at a desired location, then plucking. Lyle: Play the audio from the tab file so you can hear what this solo riff sounds like with the harmonic notes. Lyle: Use the jam track for rhythm riff 1 to practice the solo with. I'll be sending a complete jam track with both parts in a minute. Stratman: How do you get vibrato on the harmonic notes? Lyle: In it you'll see me hitting the harmonic notes at the beginning of the solo as well as the use of the whammy bar for vibrato. Lyle: After you have learned to feel the groove of this lesson in 7/8, you might get addicted to it. Odd time signatures are so different than what most of us play in which is the standard 4/4 time (4 beats to a measure). Lyle: Many of the songs Alex plays with Rush use odd time as well as many other bands like Metallica, Soundgarden and other progressive rock bands.